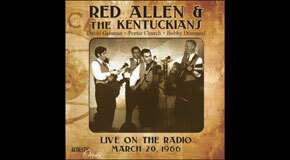 On a brisk New York City Sunday morning in March of 1966, David Grisman called his friend Pete Wernick, the youthful student host of WKCR's weekly "Bluegrass Special" radio show and told him that Red Allen and his Kentuckians (the band David had just joined) were in town and available to play on his show. An hour or so later the Kentuckians (including Red on guitar, David on mandolin, Porter Church on banjo and Bobby Diamond on fiddle) showed up at the Columbia University station to play and talk bluegrass for the next hour or so. Fortunately the show was recorded in its entirety so we can all hear the music that was played that day.